Check out the forum post here. 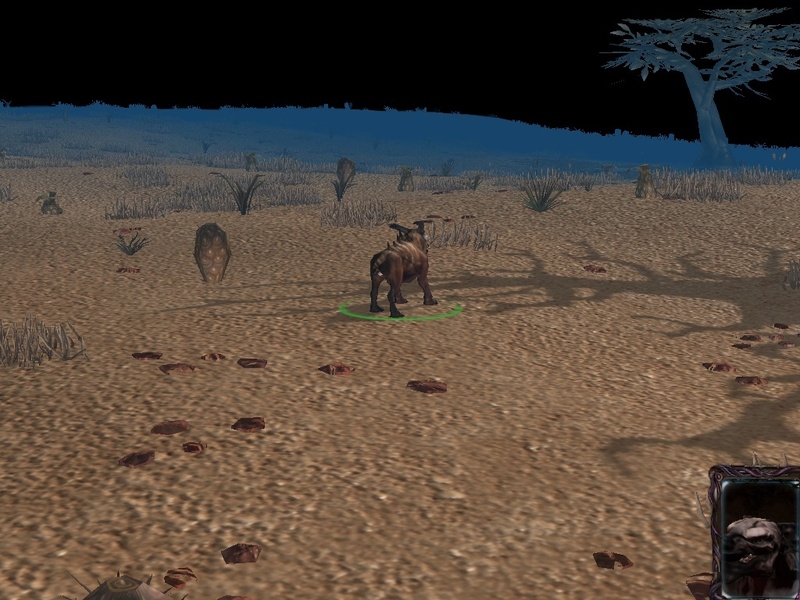 Play as a wolf in Aiurfrica, which is a zone modeled after Africa (duh?). You can run around freely and explore. Exploring certain secrets can lead to special rewards. Your wolf has 4 different life sources: Health, Hunger, Thirst, and Rest. If any of the life sources dries out, you die and lose the game. Health regenerates over time, and goes down if you suffer a blow (by bigger carnivores, defensive herbivores, or just human hunters). Hunger is the life source you always need to lay your eyes on. Hunger depletes quicker than any other life source, and you must hunt down weaker animals to fill it up. If you do not hunt at least once a day, you are in big trouble, and will depend on at least two hunts the next day. Hunting is a tricky thing to learn, and even trickier to master. Prey that will flee from you, will obviously be much faster, and although you have certain abilities at your disposal (i.e Dash), approaching at prey carelessly will be a huge risk, and you must use stealth and your environment in order to succeed. Certain prey will not flee from you, but will require you to best them in a battle in order to eat them. In a simple one on one battle, you'll lose, and you'll die. You must use your abilities as best you can, in order to take down the larger prey. Thirst is not too complex to fill up, you must simply find an oasis and drink from it, sounds easy? well it is, depends when. When a pride of stronger animal is using the oasis, they will not accept you, any false move, and they will charge at you. If other weaker prides use the oasis, they will simple flee, or just ponder at your actions. Remember: there could be more than one oasis. Rest is as simple as it sounds. There is a day/night system(a day will last about 5 minutes), and at night, you need find a safe location to fall asleep in. If you do not sleep in a safe location, other animal will disturb you constantly, and your rest bar will not be filled for the night, and will have to be filled the next night. Try not to not sleep 2 days in a row, it could kill you. Each day is counted, and your main objective is to survive as many days as possible. In time to time the difficulty will increase as certain events will occur (Hunter season? rainy-day and more). If the single player is a success I do plan on releasing a multi player version, when you and your team-mates play as a pride, and have to do certain hunt tasks while working together. I'm working of perfecting the movement system and its comfort while avoiding the use of W-A-S-D. As a result I've made a special pathfinding system for the movement, which will make your life that much easier when trying to pass though heavy terrain areas such as rocks, trees, or just trying to flee. I will provide more updates and information on the movement system soonish. The 'story' is coming along well and so is the terrain, mechanics and abilities are also just about done. A new preview should be out within the coming days. soooo..... the project is dead? It looked so promising. I was wondering, how are you using hunger is it going to be like the second you kill something it goes up or is the going to be a dead body that you have to eat? Video attached to this post, for all people who cannot view the video. The YouTube player says "This video is not available." You can only activate sneak (or stealth/prowl/cloak) while in big bushes, hiding. If while stealthed you exit the bushes, you will remain stealthed for a few seconds long. You must use this opporitunity to pounce at you closest victim. Looks good, I am guessing the cloak ability is sneak , but I wonder will it be a skill or environment bases power? for example weather such as rain or sand storms, or tall grass? I will indeed require testing, but that is going to be a long time away from now. Stay tuned for the upcoming preview, should be uploaded soon. I can't wait to play this if you need any help testing I will gladly help.